Grade 1: When standing the horse shifts its weight from leg to leg (paddling). No lameness is evident at the walk, but a short stilted gait is noted at the trot. Grade 2: The horse moves quite willingly but with a stilted gait at the walk. A foot can be lifted off the ground without difficulty. Grade 3: The horse is reluctant to move at all. It is difficult to lift a foot off the ground. Grade 4: The horse will not move without being forced. It is almost impossible to lift a foot off the ground. Obesity is one of the 3 factors that make up Equine Metabolic Syndrome, the others being insulin resistance and a predisposition to laminitis. This can be overall obesity and/or regional adiposity (fat pads). Being overweight can lead to heart, lung and joint/mobility problems as well as increasing the risk of EMS and laminitis (and possibly PPID - many ponies that are obese when young develop EMS and then PPID). The longer a horse remains obese, the greater the associated health risks. Why do some horses become obese when others kept the same way do not? - possibly differences in nutrient digestion or absorption. Some breeds, especially ponies, seem to be more prone to becoming obese than others - these are often native ponies from areas with harsh winters. - not recognising when a horse is overweight. Current methods of measuring obesity/adiposity tend to be subjective (e.g. Body Condition Scoring), tend to measure subcutaneous fat rather than total body fat, and may not be accurate for comparing different breeds. Body condition scoring as a predictor of body fat in horses and ponies. "the power of log-transformed BCS as a predictor of eTBF% decreased as BCS increased.".. "The data suggest that BCS descriptors may warrant further consideration/refinement to establish more clinically-useful, sub-classifications for overweight/obese animals." Effects of season and body condition on appetite, body mass and body composition in ad libitum fed pony mares. Vet J. 2011 Dec;190(3):329-37. Epub 2010 Dec 10. "Body fat content was exponentially associated with increasing BCS but BCSs >6 were not useful indicators of actual body fat." Assessment of body fat in the pony: part II. Validation of the deuterium oxide dilution technique for the measurement of body fat. Equine Vet J. 2011 Sep;43(5):562-70. "This study provides the first validation of the D(2) O dilution method for the minimally-invasive, accurate, repeatable and objective measurement of body water and fat in living equids." Bioelectrical Impedance Analysis (BIA) was shown to correlate moderately well with deuterium dilution determination of total body fat (considered the gold standard). Body Condition Score (Henneke) showed a slightly weaker correlation and there was no significant correlation with cresty neck score. However, a lot more research is necessary before BIA can be used in practice. Redwings video below showing how to body condition score your horse, using the modified 0-5 point scoring system, by Dr Teresa Hollands - as shown in the October 2013 The Laminitis Revolution 2 webinar. Horses that are too thin, too fat and just right are used to demonstrate how to assess BCS, including a typical underweight PPID horse and a typical overweight EMS/PPID pony. The body should be divided into 3 sections: neck, middle and bottom, and each section scored separately by feeling for fat over the skeleton. 3 is the perfect score. Body condition scoring should be carried out ideally every 2 weeks on all horses, and the results recorded. Neck - there shouldn't be any fat or crest above the nuchal ligament - there is no muscle above the nuchal ligament, anything felt here is fat, not top line. A large crest will score 4 or more, bulges and corregation in the crest will probably score 5. The shoulder blade should be well defined - if you run your hand down the side of the neck, it should come to a stop at the shoulder blade. Middle - you should be able to feel the ribs, like feeling stair banisters through a velvet curtain, but hardly see them. If you can neither see nor feel the ribs, that scores 4 or more. If you place your hand over the backbone, it should form a nice curve - a triangle is too thin, flat is too fat. Bottom - you should be able to feel just feel the top of the pelvis, the hip bone and the tail bone. If you can't see or feel these bones, that scores 4 or more. In summary, if you can feel AND see bones, the horse is too thin. If you can neither feel nor see bones, the horse is too fat. Vet J. 2012 Nov;194(2):179-88. Epub 2012 Oct 30. Weight loss resistance: a further consideration for the nutritional management of obese Equidae. Argo CM, Curtis GC, Grove-White D, Dugdale AH, Barfoot CF, Harris PA.
More than 27% of 127 horses and ponies in Somerset were found to be obese (assessed using BCS and CNS) in February. The difference in body condition score between members of the same herd was questioned. Dugdale, Alex (2011), Doctoral thesis, University of Liverpool. Dugdale AH, Curtis GC, Harris PA, Argo CM. Assessment of body fat in the pony: part I. Relationships between the anatomical distribution of adipose tissue, body composition and body condition. Equine Vet J. 2011 Sep;43(5):552-61. Effect of body condition, body weight and adiposity on inflammatory cytokine responses in old horses. Adams AA, Katepalli MP, Kohler K, Reedy SE, Stilz JP, Vick MM, Fitzgerald BP, Lawrence LM, Horohov DW. "Reducing body weight and fat in old horses significantly reduced the percent of IFNgamma and TNFalpha positive lymphocytes and monocytes, and serum levels of TNFalpha protein. Further, when weight and fat increased in these old horses there was a significant increase in inflammatory cytokine production." "These findings demonstrate that age-related obesity potentially plays a role in the dysregulation of inflammatory cytokine production by the immune system with age or inflamm-aging in the horse." "Diet-induced weight gain in horses occurred concurrently with decreased insulin sensitivity that was effectively compensated for by an increase in insulin secretory response. Obesity resulted in hyperinsulinemia and hyperleptinemia"
Physical characteristics, blood hormone concentrations, and plasma lipid concentrations in obese horses with insulin resistance. The Sg was higher in obese than nonobese (P = 0.003) and moderately obese (P = 0.007) horses; Si was lower in obese than nonobese (P = 0.008) horses, and acute insulin response to glucose was higher in obese than nonobese (P = 0.039) horses.Obese geldings were insulin-resistant and seemed to rely primarily on Sg for glucose disposal. Is using a weight tape accurate? This research concluded that estimating the body weight of Icelandic horses using either a weight tape or calculation from the measurement of body girth and length was comparable to weighing the horse on a weighbridge (94% and 93% accurate respectively). How prevalent is obesity in horses? 31.2% of horses were classified as obese by owners in Great Britain selected to complete a postal questionnaire (no experienced verification of owner scores appears to have been carried out). PeerJ. 2014 Mar 20;2:e299"Obesity prevalence rose significantly from 27.08% at the end of winter to 35.41% during summer (p < 0.001). Breed was the risk factor most strongly associated with obesity." "In horses, neither skeletal muscle nor systemic inflammation appears to be positively related to obesity or obesity-associated hyperinsulinemia." "​In conclusion, although oxidative stress in skeletal muscle appears to occur with equine obesity, oxidative damage does not appear to be associated with obesity and is therefore unlikely to be central to obesity-associated hyperinsulinemia." Shetland ponies fed double maintenance requirements (200% net energy) showed significant increases in body weight, body condition score, and retroperitoneal, axillary, withers, intercostal and rump fat depth, compared to controls (100% net energy). "The conclusions were that a 200% NE diet induced subcutaneous and retroperitoneal fat accumulation, with the greatest increase in intra-abdominal deposits. The moderate increase of the subcutaneous fat depth followed by a plateau phase suggests the existence of a limit of adipose tissue expandability, as in man." Oligofructose is a partial hydrolysate of inulin. 9/11 horses given 10 g/kg bw oligofructose developed at least Obel grade 2 laminitis. 11/11 of these horses developed profuse watery diarrhoea between 12 and 24 hours after being given the OF by naso-gastric tube. Interestingly the laminitis appeared to be self-limiting, with 7 of the 9 horses that developed laminitis returning to being pain free 72 hours after being given OF. (Note that the oligofructose used is unlikely to have been pure, and that simple sugars are also likely to be included. Beneo Orafti oligofructose is available in purity ranging from 58-95%, with the balance being sugar. Therefore when given at 10 g/kg bw, even at 95% purity a 500 kg horse would receive 4750 g of oligofructose and 250 g of sugar. To put this into perspective, 250 g is more than 3 times the amount of sugar used in the Oral Sugar Test, so might be expected to produce an insulin response). "oligofructose, a carbohydrate usually considered indigestible in the small intestine, or derivatives of oligofructose, was detected in plasma." Microbial ecology of the equine hindgut during oligofructose-induced laminitis. Milinovich GJ, Burrell PC, Pollitt CC, Klieve AV, Blackall LL, Ouwerkerk D, Woodland E, Trott DJ. Int J Syst Evol Microbiol. 2008 Jan;58(Pt 1):262-6. Streptococcus henryi sp. nov. and Streptococcus caballi sp. nov., isolated from the hindgut of horses with oligofructose-induced laminitis. Milinovich GJ, Burrell PC, Pollitt CC, Bouvet A, Trott DJ. Milinovich GJ, Trott DJ, Burrell PC, van Eps AW, Thoefner MB, Blackall LL, Al Jassim RA, Morton JM, Pollitt CC. Changes in equine hindgut bacterial populations during oligofructose-induced laminitis. "​In insulin-resistant mares, MARINE- and FLAX-treated horses had an increase in SI (P = .09). It would be interesting to test this supplement in a larger group of insulin-resistant horses. If proven effective, supplementation with ω-3 fatty acids would help to reduce problems associated with insulin resistance in horses." Effects of two different dietary sources of omega-3 highly unsaturated fatty acids on insulin sensitivity, and incorporation into the plasma, red blood cell, and muscle cell in horses. As endocrinopathic laminitis in horses is associated with high blood insulin levels after eating sugar (particularly in grass), oral sugar testing (using either Karo Light corn syrup or glucose) has become a popular method of testing a horse's insulin response to a controlled amount of sugar, attempting to mimic the effects of grazing, and thereby guiding management of and monitoring laminitis risk for horses with insulin dysregulation due to EMS and/or PPID. The in-feed glucose test has lost popularity due to problems with horses either not eating or slowly eating the large amount of glucose mixed into a low sugar feed, and since October 2013 the oral sugar test (OST) has been the recommended test to assess insulin status in horses with PPID (according to the Equine Endocrinology Group), and from 2018 it has been the test recommended by Liphook Equine Hospital, who state that the OST has significant advantages over the in-feed glucose test. The protocol of the OST has changed several times, with 0.15 ml/kg bodyweight Karo Light corn syrup originally being administered after an overnight fast, then research at the RVC and Liphook Equine Hospital suggested that a higher dose of 0.45 ml/kg gave more accurate results, with horses not needing to be fasted before the test, and most recently the same 0.45 ml/kg dose is being suggested (by Liphook Equine Hospital), but once again after an overnight fast. The horse is given the Karo Light corn syrup by syringe or mixed with a small amount of low sugar chaff, and the vet draws a sample of blood 60 to 90 (or 120) minutes later. Some experts warn that the OST and in-feed glucose test should not be carried out while or soon after a horse has shown signs of active laminitis, as sugar levels should be kept to a minimum. or in a little chaff. The horse is fasted overnight (as above - 1 flake of hay only left in the stable at/after 10 pm). The following morning the owner administers 0.15 ml/kg bodyweight Karo Light corn syrup (containing 1 g/ml digestible sugar - i.e. 75 ml/500 kg horse) - this can be syringed directly into the horse's mouth (using 60 ml catheter-tip syringes) (or fed in a low calorie chaff feed). 60 to 90 minutes after administration of the corn syrup blood is collected by the vet and tested for insulin and glucose. Insulin > 60 µIU/ml is indicative of insulin resistance/hyperinsulinaemia. Insulin < 45 µIU/ml is normal. Insulin between 45 and 60 µIU/ml is an equivocal result and further testing is required for diagnosis. Glucose > 125 mg/dl (6.94 mmol/l) indicates an excessive glucose response. Recent work at the Royal Vet College and at Liphook Equine Hospital supports the use of a higher dose of Karo Light corn syrup as a highly palatable, safe and sensitive test for the investigation of insulin dysregulation in PPID and EMS cases. In addition to good differentiation of normal from laminitis-prone horses and ponies, the test dose contains less than half the amount of sugar that the 1g/kg dextrose powder test. There is also no need to fast the animal prior to the test and the syrup is much easier to administer to horses and ponies that the dextrose powder! - Collect blood samples for insulin and glucose (red and grey top) between 60 and 90 minutes later." Liphook Equine Hospital Laboratory can send out Karo Light test kits containing: Karo Light Corn Syrup dose (please advise weight of animal), oral dosing syringe and appropriate blood collection tubes. Please feel free to phone (01428 729509) or email: lab@theleh.co.uk for more information on these and other handy, free testing kits." Karo Light corn syrup can be purchased in the UK online from www.amazon.co.uk, and costs around £5.70 for 473 ml (a 500 kg horse will require 0.45 ml x 500 kg = 225 ml Karo Light corn syrup for the high dose test, and 0.15 ml x 500 kg = 75 ml for the low dose test), and can also be supplied to vets by Liphook Equine Hospital. The Oral Sugar Test uses significantly lower carbohydrate levels (0.15 g/kg bw) than the in-feed glucose test (1 or 0.5 g/kg bw) and therefore is likely to cause a smaller insulin peak. For this reason The Laminitis Site recommends the use of the (low dose) Oral Sugar Test over the in-feed glucose test. 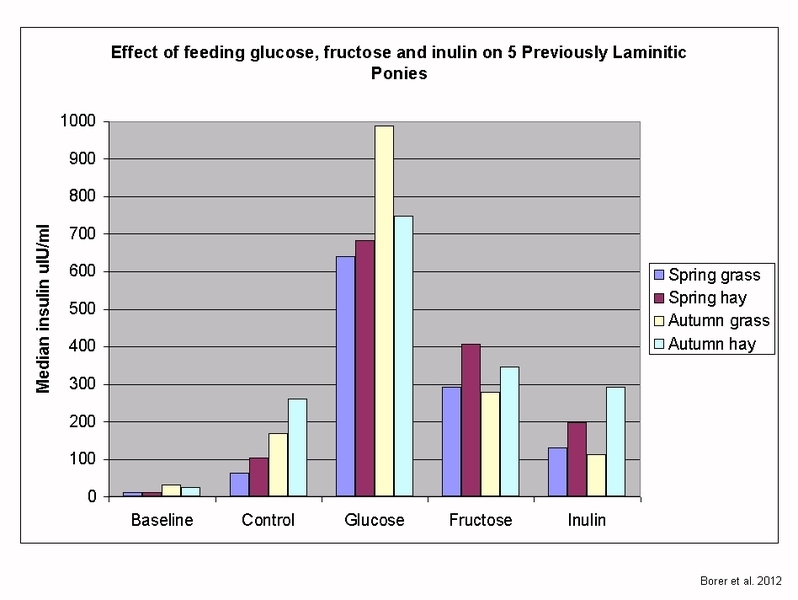 Glucose and insulin concentrations for normal horses and Insulin Resistant horses following administration of 0.15 ml/kg bw Karo Light syrup (data Nicholas Frank webcast Oct 2011 University of Minnesota). The horse should be fasted overnight (at least 6 hours). Collect blood 2 hours later and measure serum insulin and plasma glucose. Below - note the high median peak insulin concentrations recorded in research by Borer et al. (2012) when 1 g/kg bodyweight glucose was fed to previously laminitic ponies in a feed of Happy Hoof (and note how much the Happy Hoof (control) raised insulin levels above baseline (hay) - more. As with screening tests, pain, stress and recent feeding will affect results and should be avoided. "One of the most widely agreed upon ideas, regarding a diagnosis of EMS, was the use of an oral sugar test to reveal an abnormally large insulin and or glucose response seen in the blood measured 75 minutes after an oral dose of sugar is given." See article on AHF website. How does the OST compare to other insulin tests? Fasted Oral Sugar Tests (OST) and Intravenous Glucose Tolerance Tests (IVGTT) were carried out on 10 EMS horses and 8 controls (QH crossbred mares). suggesting that the OST and IVGTT insulin results are closely correlated and the OST may be a suitable test for insulin dysregulation. The OST was also repeated in 8 QH crossbred mares - the CV (coefficient of variation) for AUCg was 6.4% +/- 3.1% and the CV for AUCi was 45.1% +/- 36.2% - so there was a large difference in insulin values when the same horse was tested more than once. Do different breeds appear to have a different insulin response to glucose? Mixed breed ponies, Andalusian cross horses and Standardbred horses, all with a BCS close to 5, were given an in-feed glucose test using 1.5 g/kg bw glucose in a fibre-based feed, and a FSIGT. Glucose results were similar between the breeds following the in-feed glucose test, but there were significant differences in the insulin response to in-feed and IV glucose between the breeds. Osteomyelitis/septic pedal osteitis is the inflammation of bone due to bacterial infection - purulent exudate (pus) will be present. Although rare, osteomyelitis of the pedal/coffin bone can follow laminitis with severe rotation/sinking, usually after penetration of the sole or long-term (usually sub-solar) abscessing which extends into the bone. Non-septic pedal osteitis is inflammation of the pedal/coffin bone due to bruising, but without infection. An abscess drainage hole may lead to P3 on clinical examination of the foot. X-rays, particularly 60' DP views, should be taken, and venograms will help assess blood flow to the infected area. Once septic osteomyelitis develops, horses rarely recover - prevention is much easier than cure. On p 350 of Care and Rehabilitation of the Equine Foot, Pete Ramey talks about runaway necrosis of the corium, where horses have recurring abscessing with extreme pain, and mostly either lie down or stand in an exaggerated rocked back laminitis stance or vertical stance. Padding the feet doesn't usually ease the pain, but a palmar digital nerve block will. Venograms tend to show that the infection is due to "dead" areas in the corium, either at the sole due to chronic pressure (from uncorrected P3 rotation) or at the coronet following rapid or severe distal descent. He suggests that when these "dead" areas are seen in the corium, the situation may be hopeless and it may not be worth attempting rehabilitation. Instead, every attempt should be made to prevent this happening: “at the first signs of laminitis, restore P3 to a more natural ground plane" (i.e. 3-5 degree palmar angle), "relieve pressure on the walls and pad the sole with foam rubber – vertical sinking and destructive pressure to the solar corium can be prevented”. Constant pressure on the solar corium and separational forces on the laminae and coronary papillae must be eliminated immediately. Equine Podiatry edited by Andrea Floyd and Richard Mansmann in a chapter written by W Rich Redding p 276 suggests that the infected bone and soft tissue should be debrided and the infection drained, gaining access via the draining tract if possible and being sure to remove all infected material. It is suggested that "up to 25% of P3 can be removed without adversely affecting bone integrity". Systemic and regionally perfused antibiotics are administered, and following surgery the foot must be checked and covered with a sterile bandage daily. "Oxidants are essentially generated by metabolic enzymes, inflammatory cells and mitochondrial electron leakage; they are indispensable for the cellular redox regulation and may, under certain conditions, have a pro-inflammatory stimulatory role. Endogenous and exogenous antioxidants counterbalance the oxidative processes and so maintain the oxidant/antioxidant equilibrium. Excessive oxidant generation or antioxidant insufficiency can lead to oxidative stress." "Oxidative stress refers to the cellular injury and pathologic change that occurs when there is an imbalance favoring oxidants over antioxidants within a living organism." "CONCLUSIONS AND CLINICAL RELEVANCE: There was no evidence of systemic accumulation of oxidative stress markers or deficiencies in antioxidant capacity in horses with PPID, suggesting that these are unlikely to be major predisposing factors in the development of PPID. Manganese superoxide dismutase activity in the pars intermedia decreased significantly with increasing age. Role of an age-associated decrease in antioxidant capacity for the pars intermedia in the development of PPID in horses warrants further investigation." "The observed abnormalities in glucose metabolism and oxidative stress could potentially contribute to development of laminitis in horses with ECD, by similar mechanisms to those that cause microvascular dysfunction in human diabetics."